Gluten is in a majority of everyday items that people eat, and it is usually found in wheat and flour. Thus, every bread, pie or cake that is out there probably has gluten in it. An allergy to gluten means having to cut back on gluten. Scientist are still not sure what causes a gluten allergy in either kids or adults. However, they do know that by removing or reducing gluten in the diet, you can alleviate or greatly diminish symptoms that you feel. Adults and children both often show digestive issues such as abdominal cramping, gas, bloating, diarrhea and vomiting. Constipation can also be seen, which is more common in children than adults. These digestive issues can swing from one extreme to the next after eating gluten. In both kids and adults, a mental daze can come over, making you feel as if you are sluggish and cannot think properly. This is more noticeable in adults as they may become forgetful. Whereas children may just show signs of extreme fatigue due to mental exhaustion. 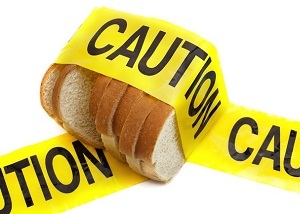 Many times, adults and children who have gluten allergies have intense mood swings. The person can go from one extreme to the other without any reason. This is more noticeablein children rather than in adults. Many adults find they have migraine headaches more often and painful joints. Children often complain of headaches and body aches. This is due to the inflammation that gluten allergies can cause in the body. Adults and children who break out in rashes after eating food that contains gluten are more likely dealing with a gluten allergy.These skin rashes can appear up to 36 hours after eating gluten. It is often red and very itchy. Many times it is mistaken for eczema, however, this skin condition often signifies a food allergy. Within the neurological issues area, you can experience bouts of being unable to sleep, dizziness, feeling as though you do not have any balance, and perhaps most telling is when you start to experience the feeling of pins and needles in the feet, legs and arms even though you should not have this. Many times adults and children who catch colds and flus easily are often thought to simply have a low immune system. However, when you catch colds and flus, you are supposed to get over these pretty quickly. Many children and adults go on showing signs of runny noses and other issues long after the cold or flu should be gone. When this happens, you should think if you have a gluten allergy. There are several other symptoms that people need to be aware of when dealing with a gluten allergy. Adults who are having trouble conceiving, whether this is a man or woman, could be dealing with a gluten allergyas this can affect the entire body. Children often have black ringsunder eyes despite getting enough rest shows there is something wrong with their body which could be an indicator of gluten allergy. Gluten allergies can also cause hormone imbalances in women which can result in a harsh case of PMS. Celiac Disease, Gluten Allergy and Gluten Intolerance, What’s the Difference? It takes a blood test to find out if you have celiac disease. If you are positive, you will be asked to remove gluten completely from your diet. The difference with celiac disease rather than just gluten allergies or intolerance is that the villi in the small intestines become damaged, causing permanent issues. This can be very devastating to children who are still growing. This is not as common as simply having an intolerance towards gluten. Those who do have a gluten allergy often have issues arise when eating gluten,which can be life threatening. Those with gluten allergies are often identified with an intolerance of gluten due to the fact that the symptoms may not be life threatening. An intolerance for gluten can be mild, only requiring a person not to eat as much gluten. Or an intolerance can be high, meaning the person has to cut out the gluten in their diet. An intolerance is categorized based on how severe it is for the individual. Among all the three, gluten intolerance is usually easiest to be managed.